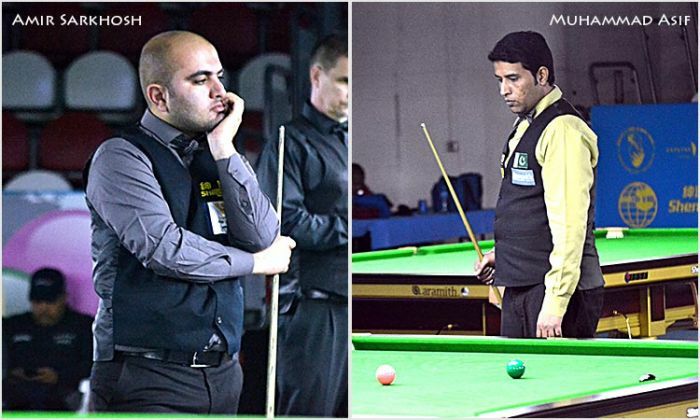 Iranian player Amir Sarkhosh edged a 4-3 victory against American player from Indian origin, Omar Balsara on Day 2 (first session) of 2017 IBSF World Snooker Championship here in Doha, Qatar. Amir was leading two frames when Omar put him on hold and won next three frames to take 3-2 lead. Well known for his good snooker ability in Indian region, Omar Balsara had moved to America and now has returned to snooker world as American citizen after a much gap. Being two frames down, Omar showed his scoring power to go ahead 3-2 up. But eventually it was Amir who stayed strong to play much controlled game and saved match that could’ve gone to Omar. Same way in the second session, 2012 World Champion, Muhammad Asif of Pakistan also fallen into the trouble, despite leading frames against Indian player E. Pandurangaiah. This is Pandu’s first appearance in any World Championship and in today’s match, he made blistering start with a break of 55 in the fourth frame to cut the deficit. Asif tried hard to give a quick closure to the match, but each time Pandu recovered well with great shots and forced decider. In that alarming situation, Asif played his best knocks to score 50 points break and survived from the match losing threat.